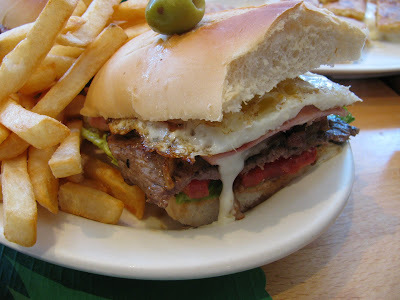 El Rey del Chivito - "Chivito" translates as "little goat." There is no goat in a chivito sandwich, but there is just about everything else you could think of. You can get the full contents of this Uruguayan classic, and the backstory on its name, in my post here. You can get the sandwich at El Rey del Chivito on Collins Avenue, just a few blocks north of the Deauville. Buenos Aires Bakery - Up the street, Manolo claims to have the best churros in town. They're full of crap. The best churros are at Buenos Aires Bakery, where they're light, crisp and un-greasy - and possibly even better when filled with dulce de leche. They also have a very nice selection of Argentinian empanadas, as well as sandwiches and a short selection of hot dishes. El Rincon de Chabuca - I may just like it because I call it "El Rincon de Chewbacca," but aside from that, you can also get a fine sampling of Peruvian staples here - ceviches, causas, anticuchos, plus heartier fare like lomito and arroz chaufa. 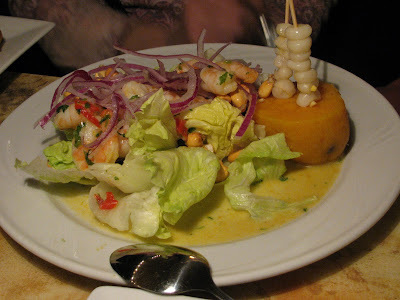 You can read all my thoughts on El Rincon de Chabuca here. Sazon Cuban Cuisine - it seems the first question 90% of the visitors to Miami ask is, "Where can I get good Cuban food?" And I have a confession to make: I just don't get all that excited over Cuban food. Somehow the spice route seems to have entirely bypassed Cuba, leaving it to create a cuisine entirely based on garlic, bay leaf and oregano. But it can be hearty and satisfying, and when I'm in the mood, my neighborhood place is Sazon. Their garbanzos fritos, generously studded with chorizo and ham, are flat-out delicious, and everything else is always done right. If you're in South Beach, and drunk, sure, go to Puerto Sagua, it's the Cuban equivalent of a greasy spoon diner. If you'd like a decent meal, try Sazon. Moises Bakery - not exactly a sit-down place though there may be a couple tables outside, pop in to get some of their baked goods. The sweet stuff looks tempting, but my favorites are the savory items: fried Venezuelan empanadas, chewy, pretzel-like cheese-stuffed tequeños, and the fantastic cachitos stuffed with ham and cheese. If we're still hungry for more tomorrow, we may wind our way back up the causeway through the Normandy Circle area and back to the mainland. Sending tourists to El Rey del Chivito is some sort of suicide mission I think. The chivito sandwich presents no more danger to tourists than it does to locals, though cardiologists will tell you that danger is substantial.